The Affenstein panorama was taken at a viewpoint of the trail (with the signpost "yellow line") near the Domerker. In the background left you can see the Torsteine and the Falkenstein. 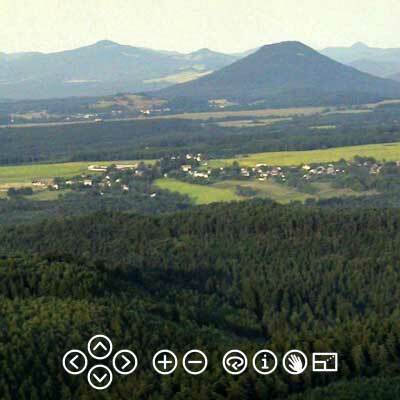 The center of the picture is dominated by the Hohe Liebe, a wooded mountain cone. On the right and in the foreground are rocks. Opposite are the Höllenwand and in the middle of Sandloch the climbing rock Großer Dom. 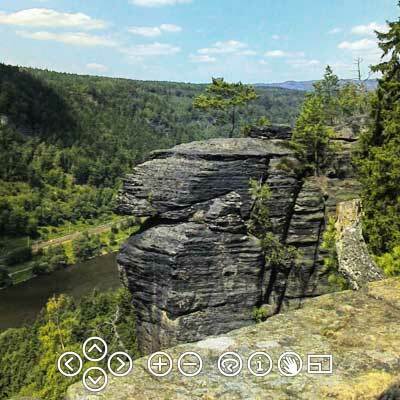 The Schrammsteine located near the river Elbe between Bad Schandau and Schmilka. This panoramic view was built at the Schrammstein-view-point. The Affensteine located in the center of the National Parc. The panoramic photo was taken on "Domerker". 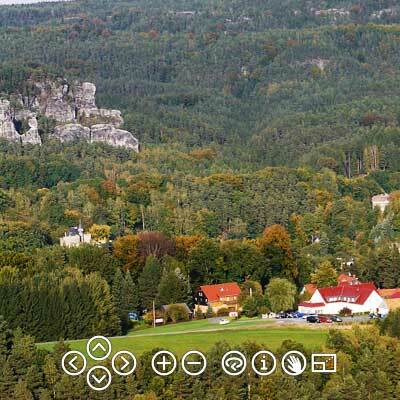 The panoramic photo of the "Kaiserkrone" covers the entire course of Schrammstein mountains along the Elbe. Furthermore, the views of the Great Winterberg extends into the Czech Switzerland. The panoramic photo from Gohrisch was taken on the north edge of the summit. In good weather you have a visibility up to Dresden. 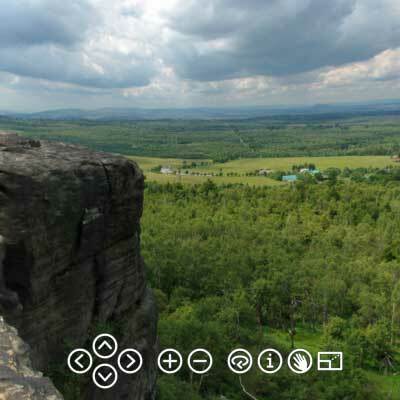 The bastion-rock massif is mapped with multiple panoramic images in different seasons and weather conditions. 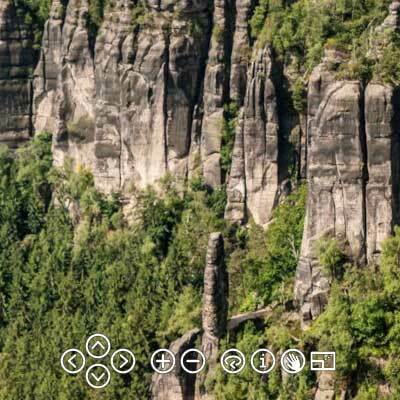 The Rauenstein is a beautiful hiking destination and is located between Rathen and Wehlen. 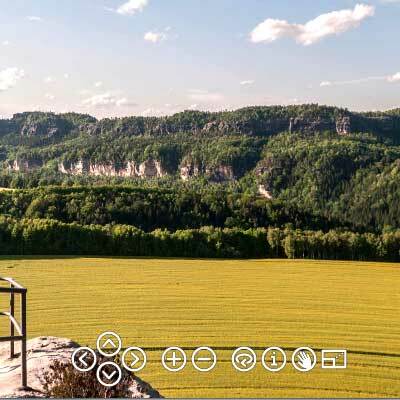 The panorama offers a view to the "Bastei" and the mesas of the Saxon Switzerland. 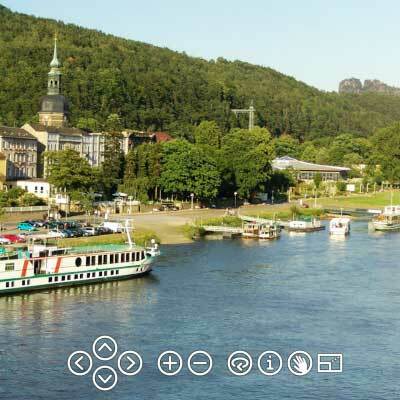 Bad Schandau is picturesquely situated in the Elbe Valley. The panorama was taken from the opposite (the Old Town) Elbe. 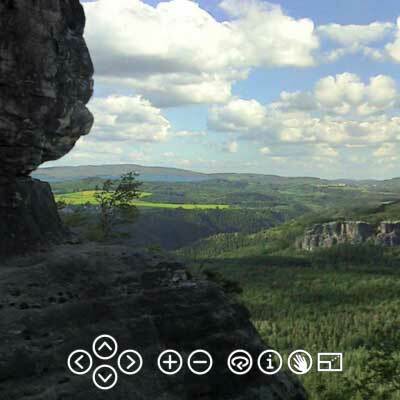 The panoramic photo from "Heringsgrund" was taken above the "Fluchtwand". 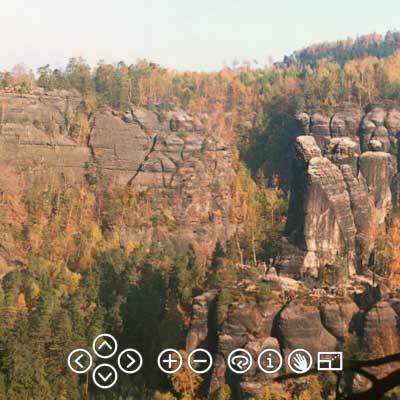 Here there is a small junction from "Reitsteig" to the viewpoint. The Frienstein (Vorderes Raubschloss) was in the Middle Ages a Castle of the Robber-Knights. Today this mountain is a climbing rock. The "Kuhstall" is located on the "Neuer Wildenstein" and has a colorful history. 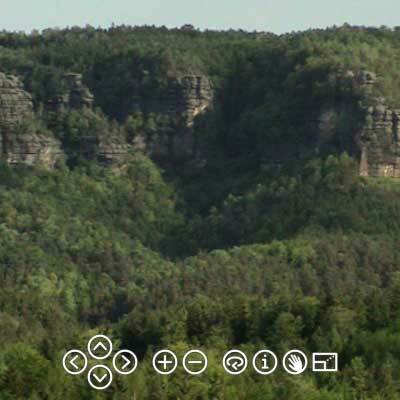 The panorama offers a view to the "Kleiner Winterberg" and the "Bärenfangwände". 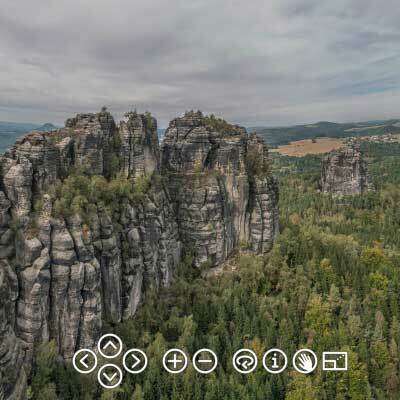 The "Grosse Zschirnstein" is with 561 m the highest mountain in Saxon Switzerland (the German part of the Elbe Sandstone Mountains). 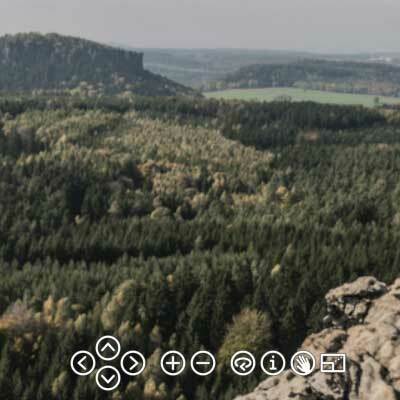 He lies directly on the border with the Czech Republic and the panoramic photo offers a view into the Bohemian Switzerland. 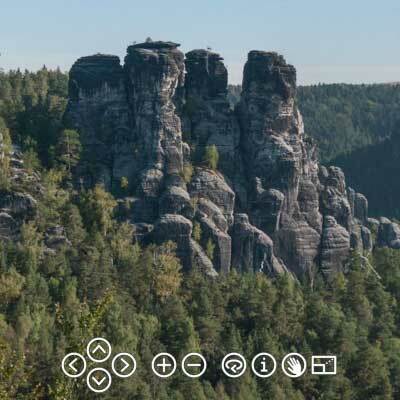 The "Hoher Schneeberg" is the highest mountain (722 m) in the Elbe Sandstone Mountains and he is located in the Bohemian Switzerland. The panoramic photo was taken at the "Dresdner Aussicht". From here you can actually see the mountainside next to the Elbe in Dresden at distance vision. One of the oldest viewpoints Bohemian Switzerland is the panoramic terrace Belvedere. In a panoramic view of 360 degrees you look at the 150 m deeper Elbe Valley and also to the former theater venue on the terrace.